iClever Stereo Headphones - The iClever Bluetooth headphone with 8mm dynamic speaker, fully housed by Crafted aluminum, delivers crystal clear STEREO soundtrack. 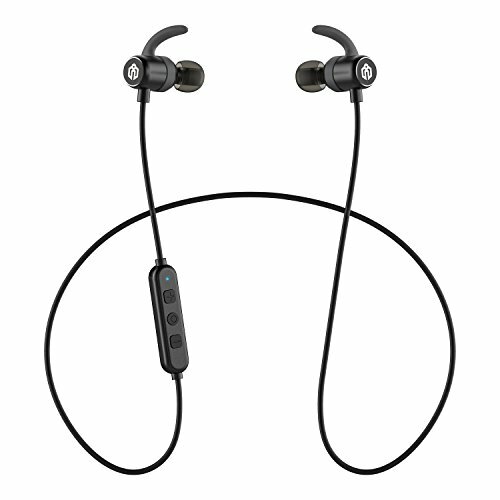 1.5x LONGER BATTERY LIFE: iClever sports headphones offers up to 10 HOURS music / talking time, 260 hours / standby time, 1.5x longer than the other wireless earbuds, and the bluetooth headphones can be fully charged in 2 HOURS. NANO-COATING WATERPROOF: The bluetooth headphone are rated IPX5. Internal hydrophobic nano-coating for ultimate protection against water and sweat, except immerged into deep water. UNIVERSAL COMPATIBILITY: Sports headphones compatible with all the Bluetooth enabled devices, Apple iPhone, Apple iPad, iPod Touch, Macbook, Apple watch, Samsung and all HTC, Huawei, ZTE, Xiaomi, Lenovo, Sony Smartphones and Tablets.